In the west of Vancouver at the University of British Columbia on the cliffs of Point Grey, totem poles mark the way to the Museum of Anthropology, world-renowned for its displays of Northwest Coast First Nations art. 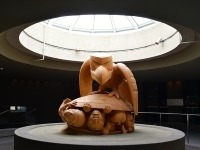 One of its main features is the world's largest collection of works by internationally acclaimed Haida artist Bill Reid, including his famous cedar sculpture 'The Raven and the First Men'. In the museum's unique Visible Storage Galleries, more than 15,000 objects and artefacts from around the world are arranged according to culture and use. In the grounds of the museum are two Haida houses, showing the dramatic beauty of traditional Northwest Coast architecture.